We hope the following information will be of help to you on your puppy search. Have you owned a Golden Retriever before? If No, please visit www.grca.org and read through Is a Golden Retriever Right For You? 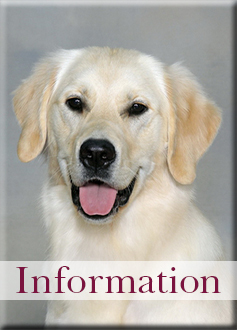 Have you read the AKC or CKC Golden Retriever Standard? The Standard is a written description of what a Golden Retriever should be (AKC). Please take the time to read the official standard prevalent on the GRCA and/or the GRCC websites. 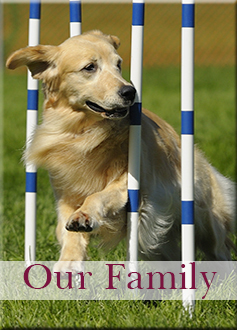 Are you familiar with the hereditary problems in Golden Retrievers? For the well-being of your new puppy please read the Health and Research section found on the www.grca.org website. Are you aware of the large role that proper nutrition, exercise and vaccine protocol play when it comes to environmental influence and overall health of your puppy? 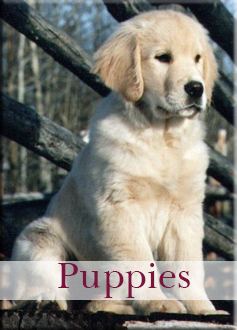 In many cases owners don’t realize growth plates don’t close on a Golden puppy until they are close to 18 months of age and they allow a puppy to jump freely off furniture, race up and down stairs or jump off vehicle tailgates, jog with a puppy for miles or bike ride, lift or pull on a puppy by their legs etc. This excessive activity or letting a puppy (especially a large breed) become overweight or feeding a fast growing puppy too much food can actually increase the chances of diseases such as hip or elbow dysplasia by 50%? 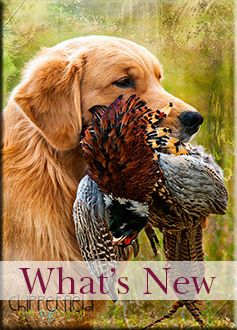 Are you willing to perform health clearances on your Golden Retriever? Annual Eye Exams by a Board Certified Ophthalmologist are a MUST for ALL Golden Retrievers to detect Pigmentary Uveitis and treat at early onset if they become affected. At 2 years of age, a once in a lifetime health screening of Hips, Elbows and Heart, provide invaluable information or peace of mind. Also, this information is invaluable to future breeding decisions for the breed. If you are unwilling to have these exams done, please consider another breed of dog.